•The WAIKANAE MUSIC SOCIETY now has its own hour-long monthly radio programme "Concert Notes" which will be on Coast Access Radio. You can listen on 104.7FM on Sunday 13 October at 12 noon, with repeats on Tuesday 15 October at 6pm, and Thursday 17 October at 2pm. 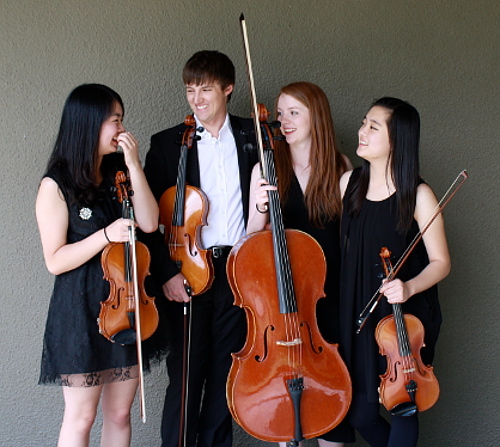 •The WAIKANAE MUSIC SOCIETY Charitable Trust for Young Musicians is now inviting applications for the 2013 Scholarships. See the "Young Musicians Trust Page" above for details. Anna Leese is one of New Zealand's most successful young sopranos and a rising star on the international operatic stage. Among her numerous awards are the 2001 Dame Sister Mary Leo Scholarship, the 2002 Mobil Song Quest, and the 2003 McDonalds Aria Scholarship in Sydney. Joining Anna for the recital is pianist Terence Dennis, widely regarded as one of New Zealand's finest musicians, and a highly-sought after accompanist to many singers both in New Zealand and abroad, including Dame Kiri Te Kanawa and Bryn Terfel. The Streeton Piano Trio's concert was one of the great delights of our 2012 season, so much so that we couldn't wait to invite them back. If you missed them then, make sure you don't do so again, as this is a trio to watch. Formed in 2008, the Streeton Trio is the first Australian ensemble to be selected for the prestigious European Chamber Music Academy, where it has been in residence since 2010. 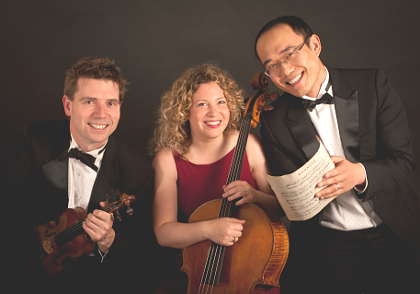 Named after the Australian Impressionist painter, Sir Arthur Streeton, the trio was winner of the 2011 Musica Viva Chamber Music Competition, and finalist in prestigious international competitions. For this tour Martin Smith, who has a broken wrist, will be replaced by the acclaimed Australian cellist Julian Smiles (better known as the cellist of the Australia Ensemble and the Goldner String Quartet). Another very welcome return to our stage is pianist Oleg Marshev who previously played for us in 2008 to a very enthusiastic audience. This time he offers a rare chance to experience the magical sound world of Debussy's second book of Preludes, followed by Mussorgsky's famous virtuoso showpiece Pictures at an Exhibition. Born in Baku in the former USSR, Oleg Marshev received his musical education in Russia at the Gnesin School for Highly Gifted Children and at the Moscow Conservatory. 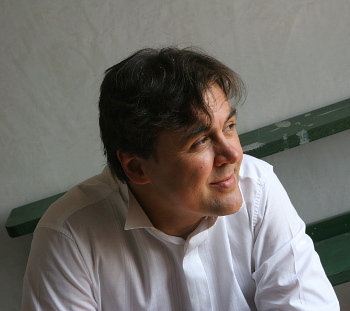 Resident in Italy since 1991, Marshev has received awards in several international piano competitions, including four first prizes. He caught the attention of the classical music world with his authoritative recordings of the complete solo piano music of Prokofiev, and has since recorded over thirty CDs, firmly establishing his reputation as among the most talented Russian pianists performing today. The New Zealand Guitar Quartet adds novelty to our season with a programme of original and arranged works by a wide variety of composers. 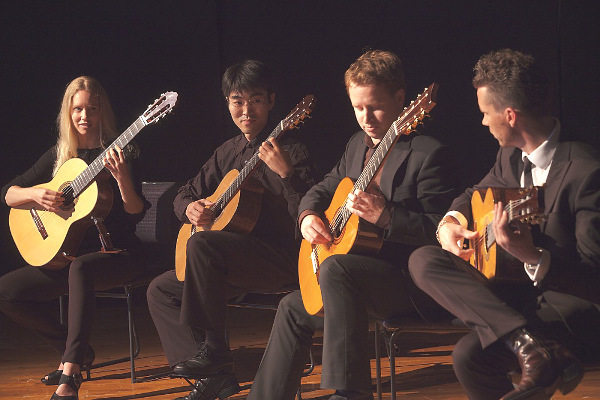 The quartet's members have earned acclaim as soloists around the world and in a multitude of international guitar competitions, while together each contributes their individual strengths toward creating an exciting, dynamic and engaging ensemble. The quartet comprises four of New Zealand's finest concert guitarists. Owen Moriarty, Jane Curry, Christopher Hill and Tim Watanabe. Jian Liu was another wonderful discovery in our 2012 season, impressing us with his impeccable musicianship and technical prowess when he stood in at 24 hours notice after Piers Lane was injured. This year he returns with his trio from the New Zealand School of Music where he is Lecturer in Piano, Inbal Megiddo is Lecturer in Cello and Martin Riseley is Associate Director of Performance. A brief piece by their NZSM colleague John Psathas will provide an interesting contrast between Beethoven's well-known "Ghost" Trio and the emotional intensity of the mighty Tchaikovsky Trio. In this special concert to celebrate the Waikanae Music Society's 35th birthday, our regular favourites the Amici Ensemble will also celebrate their 20th appearance in Waikanae. All seven string players are prominent members of the NZSO, while pianist Kirsten Simpson, making her Waikanae debut, is a young NZ pianist who specialises in piano accompaniment. This exciting programme includes the premier performance of a new piano quintet written for the occasion by New Zealand composer Christopher Blake. Mozart's Grande Sestetto Concertante will be heard in an 18th century version for string sextet. Richard Strauss's Metamorphosen was written during the closing months of the second world war.Although it is better known in an orchestral version, Strauss originally sketched the work for seven strings. The audience response to Michael Endres after his 2011 Waikanae recital was probably the most tumultuous in the history of the society. His playing of the first set of Schubert's Impromptus was sheer delight, so it is exciting that we can now hear this world-renowned Schubert interpreter play the rest of these charming works. They will be followed by Chopin's wistful, dreamy Barcarolle. Two of Ravel's best-loved works will open the second half, leading on to Gershwin's famous Rhapsody in Blue. 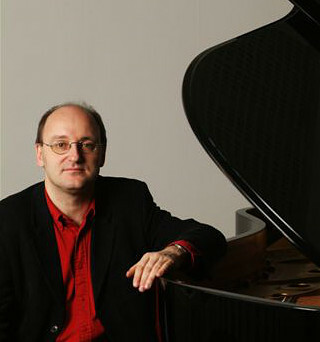 Described as "one of the most interesting pianists recording today", this German pianist joined the faculty of the University of Canterbury in 2009 as Professor of Piano. He performs worldwide as soloist and chamber music partner, and has built up an impressive CD catalogue, with stylish and highly individual interpretations of Schubert, Schumann, Mozart and Weber. This concert brings us something different to celebrate the first day of spring---a busload of enthusiastic and talented young German musicians! 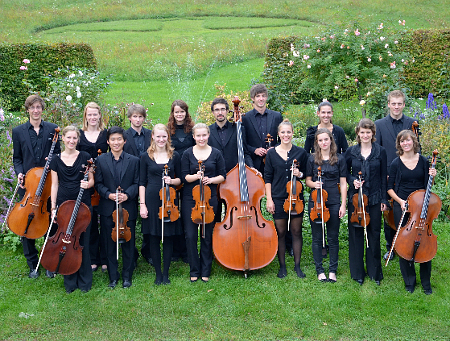 The Heidelberg Youth Chamber Orchestra is a prize-winning string ensemble of around 20 players. Their electrifying performances have impressed audiences throughout Europe and in North America. Under the leadership of their acclaimed musical director Thomas Kalb, these extraordinary young musicians make up one of the best youth chamber ensembles in Europe and have taken top prizes in a number of orchestral competitions. Their popular programme of well-known works by Grieg, Arensky and Tchaikovsky is sure to be presented with the precision and panache for which they are renowned. The Lazarus String Quartet is a youthful ensemble presenting an appealing programme of Haydn, Beethoven and Brahms. They are all graduates of the University of Canterbury and have been playing together in various ensembles from a young age. 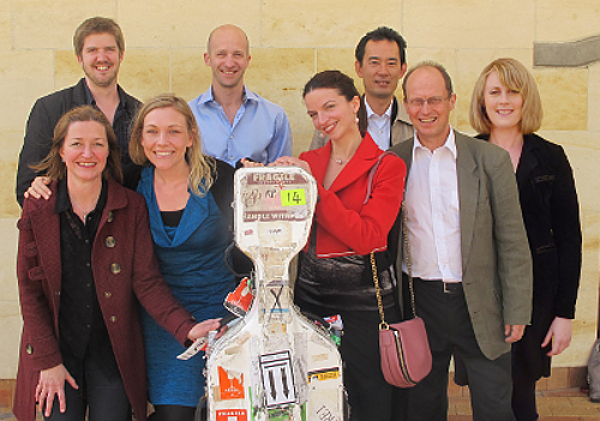 In 2009 the quartet was the recipient of the 2010 ROSL Arts/Pettman Scholarship which enabled them to make an exciting trip to the UK where they received tutoring, attended concerts and were able to perform in many prestigious venues. They have had coaching from an amazing variety of eminent musicians, including Andras Schiff, Pinchas Zuckermann and the Doric String Quartet. Most recent and exciting news for the quartet is that they have been accepted into the Masters programme at Hannover University---a rare honour. "These pages were last updated on October 6th, 2013"